Starbucks gave me a free grande latte today for the right reason. It was free but it still cost me. Since Howard Schultz has recaptured the helm at Starbucks a lot of sweeping changes have been put into effect. Here's the deal. If you use a registered Starbucks card like I do, you gain a few extra privileges. One privilege that I benefit from is free soy milk that typically costs me forty cents extra per cup. That's a great deal since everyone seems to charge extra when choosing soy milk. Another nice Starbucks Card extra is a free tall drink when you buy a pound of coffee. I recently bought the new Pike Place Blend that I consider amazing. I typically buy a half pound at a time but that was before they were offering a free drink. Today I bought the whole pound. When I went to cash out I ordered my grande soy latte, but instead of charging me the difference between a tall and grande, Starbucks offered me the soy milk free. Wait a second! I already had free soy milk coming as an extra. Where is my drink credit? The manager realized that I was feeling duped and that I was a registered card carrier, so he chose to employ the Starbucks way and give me my drink free this time around. It would be much easier if Starbucks simply included a free drink of choice with a pound of coffee when using their card. Anything short of that causes confusion, creates a buzz kill and ultimately makes me want to avoid a hassle at the register next time. It would be simpler to buy a half pound of beans and pay full price for my drink without the pressure of standing in a line of anxious caffeine zombies hoping I'll implode so they can all cheer and eat my brains. Trust me, no one wants that. Get the idea? If it's free but accompanied by a huge hassle then free comes with too big of a price. Next time I'll leave free alone. Howard Schultz is doing some great things at my newly improved Starbucks. There's still a few kinks that need to be worked out. For a short time only I'm offering Starbucks my advise for free. No purchase necessary. UUUGGGGHHHH! 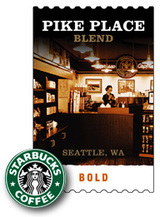 I hate the Pike Place blend and I resent that it seems to be the ONLY coffee they brew after 10 am ! My kids love their over-priced blended drinks and their cold cake. At least I used to be able to sip my steamy- black-no-calorie coffee while they slurped and chowed. But, no more. I complain each visit and am met with empathetic words from the staff who insist that it is way better with milk. To me, it tastes like a dumbed down version of their real coffee, so that Starbucks can take back some of the ground lost to McD's and Dunkin Donuts. EEEEEEWWWWWWWW! As far as free stuff, it was so confusing I didn't even catch what went on....had to read it twice. But, as always, I am good for the semi-free [re: hidden costs may apply] advice . In fact, some have accused me of living to opine. Julie... who knew you were so dark on Starbucks bold dark roast. I use the Pike Place Blend for espresso rather than drip. That may be the rub. I used to love Dunkin Donuts when I was a kid living in Rochester. Some of the better memories with my Dad were there. Thanks for that. After 20 years I quit drinking coffee last summer. Now I'm totally addicted to their Green Tea Lattes. One cool thing happened the other day when ordering drinks for work mates and myself. They over charged for one of the lattes. When I brought it to their attention they refunded the cost of the drink. *$s does train their folks well.